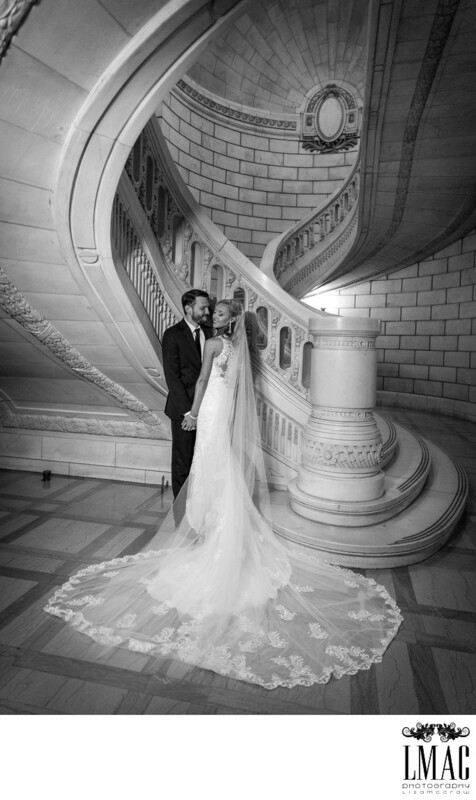 Leah and Nick selected the Cleveland Courthouse for their wedding location photos. The Cleveland Courthouse features a couple of grand staircases, marble interior, and large spaces to accommodate larger bridal parties. The Cleveland Courthouse is one of the major wedding photo locations. It has 2 floors of space that contributes to versatile wedding photos. A black and white finish to this image adds to the drama of the wedding day. The aerial angle of this image showcases the beauty of the lace veil. This veil is cathedral length, a detail we enjoy working with. Such a beautiful location for a stunningly beautiful bride and groom.